How we met: I guess you could say that we were one of the lucky ones. The story of us started all the way back in high school in October of 2009. It was my senior year in the middle of math class when we first met. A class that was optional for seniors. I don’t know what drove me to take an actual math class during my senior year. It’s the grade where everyone slacks off and enjoys what little time they have left before heading off to college or who knows what, but I honestly have no regrets. One day, halfway through the school year in October, the entire school had state exams so we were relocated to another classroom. Typically, we had assigned seating in our usual classroom and we sat in opposite sides of the room. On this day, we could sit wherever we wanted. By chance, I chose to sit next to her and at that moment, I had absolutely no idea that I had made the greatest decision in my entire life. It’s sometimes silly to think that choosing a seat has changed my life this profoundly, but I truly believe it. The best things come when they are least expected. “You have a hole in your shoe”, she said. She points at the rather noticeable hole in my black running shoes. I’ll admit, I was not wearing my best pair of shoes that day, but an ice breaker is an ice breaker, right? Those were the first words Sharon ever said to me.I was totally caught off-guard. No rebuttal.Shocked at the brashness of her astute observation. I looked down to where her finger was pointing and looked back at her. All I could do was purse my lips and nod. What an awkward, but unforgettable start to meeting someone for the first time. I somehow recovered because we kept the conversation going. We spent the rest of the morning talking about ourselves and getting to know each other. Whether it was making sure we got the same answer for number five in our assignment or talking about our backgrounds, it all came so easy. I even told her that I wanted to be an astronaut (not sure what I was thinking back in the day, but I thought it was a viable career path at the time.) and she wanted to be a psychologist(which she actually did!). She later told me that she thought I was joking when I said that. By the time lunch period rolled around, we were already well acquainted. We even ate lunch together after math class was over. After this, we were supposed to go back to our next period. We said our goodbyes and as I was walking to my next class, I felt so happy to have met someone as incredible and genuine as her. We had an interesting start. At this point in my life, I never had a relationship or a girlfriend. I was completely lost on how to approach the whole thing.I hadn’t even kissed another person! I had never known what it means to be in love or how to be romantic with someone. I was pretty outgoing as an individual, but when it came to approaching girls, I froze dead in my tracks and mentally broke down unable to make a move. It took me an entire month and a half to pull myself together and finally ask her out. It was already November and I was starting to get hints that she was into me and I already knew that I was completely into her. I knew at this point that it was now or never. It was the Wednesday afternoon before Thanksgiving recess. It was the final period of the day. I was stuck in woodshop thinking about how I was going to do it. I gave myself a deadline and the bell at 4:30 couldn’t come any slower. We always met at the front of the school. It was our unofficial meet up spot where we would hang out until her mom came to pick her up. It was easily my favorite part of the day. Getting up early, dealing with school and boring classes was always worth it just so I can hang out with her for an hour. I never wanted it to end. I made my slow walk over to the front of the school. My heart was racing and I could feel a lump in my throat. To say I was just nervous was a huge understatement. I saw her waiting for me and I so was done being the shy guy. We spoke for a while about how our day went and how we were going to spend our Thanksgiving with our families. The hour had passed and I still hadn’t asked her out. Her mom was going to show up any minute. I didn’t have much time left. I took a deep breath and closed my eyes. “I really like you and I really want to get to know you better”, I said. “Would you like to go out with me?”, I asked. It was finally out. All my nervousness instantly subsided. I don’t remember what she said in response, but it was another one of her wisecracks that caught me off guard. I could tell she meant yes because her eyes lit up and her smile was wider than ever before. It was time for her to go. I went to give her a quick kiss on her lips, but she assumed I was going for a kiss on her cheek so she turned her head and I kissed her cheek instead. She noticed this. WHAT A BLUNDER! She cut the sudden awkwardness by saying she had to go, but we both knew that we had finally taken the next step. I watched her walk to her mom’s car and drive off. I started my walk home and I was so unbelievably happy and relieved that I had finally done it. I was on cloud nine. I had finally asked her out. I couldn’t believe it. I smiled the whole way home. We spent our Thanksgiving with our families, but texted the entire weekend. I wanted Monday to come so badly. Monday morning rolls around and the first class of the day is math class. I saw her and she saw me. My heart started racing again. We said hello to each other with huge smiles on our faces. We held hands. I went in and gave her a quick kiss on the lips. My first kiss ever. It was November 30th, 2009 and I had no idea that my life would never be the same. I had met my best friend and the love of my life all at once. I felt and still feel like I am the luckiest guy in the world. I feel complete when I am with her. Eight and a half years later and she is still the light in my life. The reason I strive so hard in everything I do. As I write this, it fills me with so much excitement. I can’t believe I get to marry my best friend. One night, while lying in bed on my phone, I was surfing the internet when all of a sudden, I found myself looking at engagement rings. It caught me by surprise the moment I became aware of what I was doing. We always said that we would get married once we finished our schooling. I had already graduated from engineering school and she had already started pursuing her doctorate in family therapy. So right then and there I began my search for the perfect engagement ring. I always knew she wanted a sapphire or tanzanite (feel free to Google) as the stone. It didn’t take long to find something I knew she would love. I ended up getting a custom-made tanzanite ring on an18-karat white gold ring with a halo setting from the amazing people at Jae’s Jewelers in Miami, Florida. One of my high school friends who worked there actually helped me design the ring! Once everything was selected, waiting for the ring to be finished felt like an eternity. When it was complete, I was completely taken away by how beautiful it was. The only thing I was nervous about was if she would actually love it! With the ring decided, I realized the hard part was just beginning. We were together for almost seven years at this point. In our circle of friends, we were seen as the power couple that has defied all odds. I knew that the pressure was on. To create a proposal that would take her breath away. A proposal that she will never forget for the rest of her life. One that will have everyone talking. The pressure was on and I had so many ideas. I thought of flash mobs, proposing during the 2017 solar eclipse, while in another country, Napa Valley, etc. My head was spinning. It took me an entire year to start narrowing my options down. 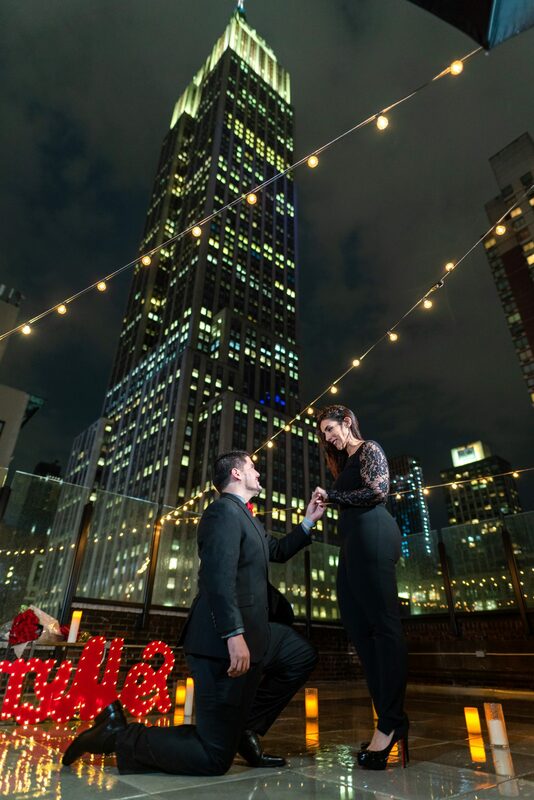 After a long time of going over all the possible options, I decided to do a night time proposal on a rooftop in New York City since we were already going to visit and I felt like I could capitalize on the situation. 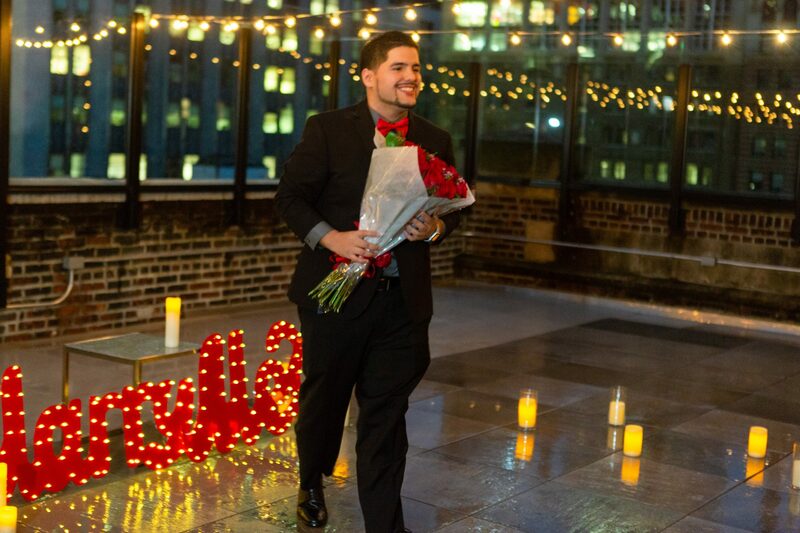 The mere thought of finding a rooftop to propose on without drawing any suspicion and having it decorated sounded like a logistical nightmare. It also didn’t help that Sharon was a natural-born detective. 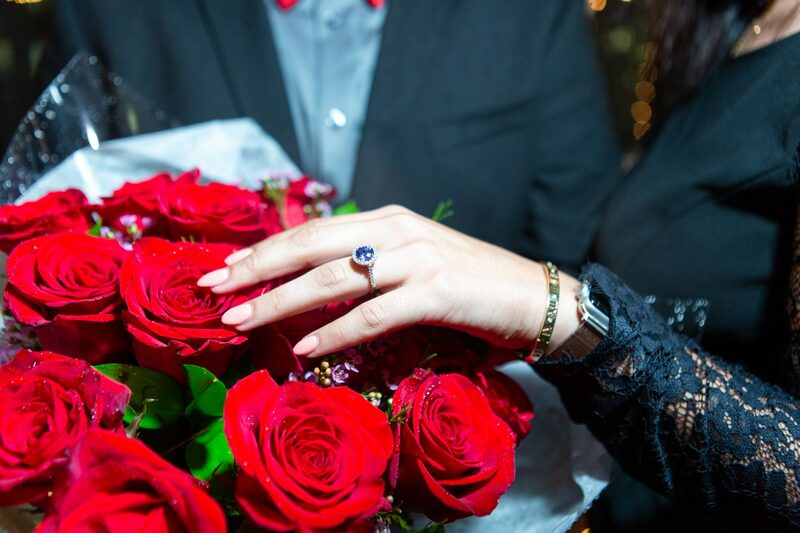 She could pick up on things so easily and it was my greatest fear that the surprise engagement would be ruined. 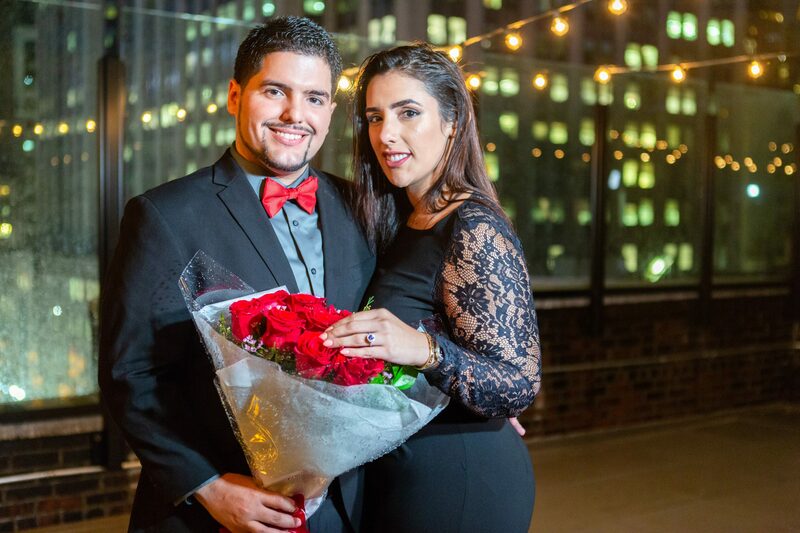 I looked around for a bit to see if someone else had attempted this crazy feat and found that there is an event planning company called Proposal007. 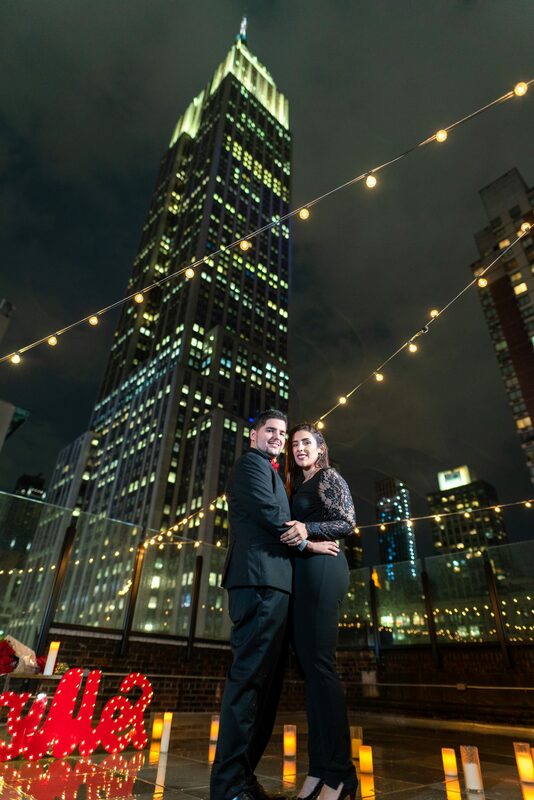 They specialize in engagements and proposals in New York City. After a year from the date I purchased the engagement ring, my plan to propose to Sharon was finally moving forward and starting to take form. A random trip out of the blue to New York would raise various red flags. Luckily, Sharon is a huge Harry Potter fan and months before this, we decided to go see their Broadway production at the Lyric Theater. I had the perfect alibi. There was no way she could see this coming. Her parents were also in on it and came along on our trip to New York under the guise that it was Sharon’s stepdad’s birthday. With the rooftop plan all set up, ring in hand, and flights all sorted out, I was ready. All I had to do was stay calm and collected. The flight was easy and uneventful. It was only when we were 10 minutes from landing at LaGuardia airport that I started getting nervous. Out of my window seat, I could see Manhattan down below. Somewhere in that beautiful, sprawling jumble of lights and skyscrapers I was going to propose to the person sitting next to me. We landed, hailed a cab and got to the hotel. Her mom had the ring so I had no worries about it being found accidentally. Things were going smoothly. 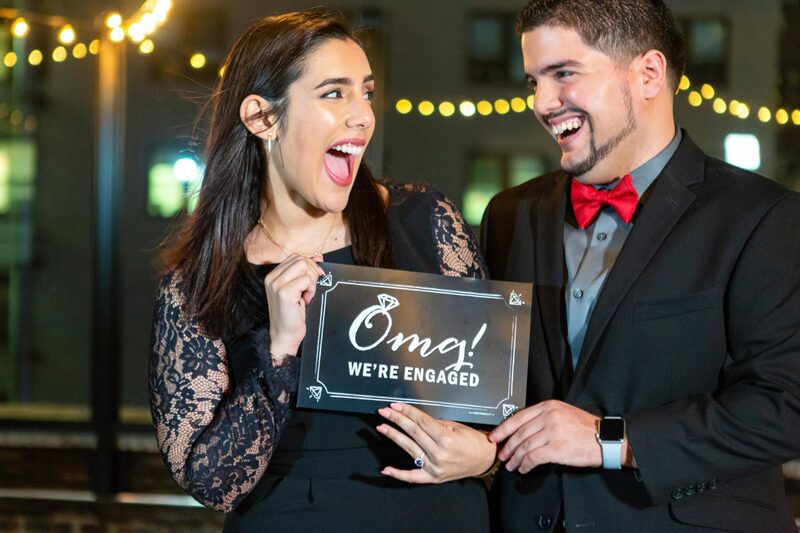 As I write this, I realize there was no easy way I would have been able to keep it the proposal a secret while we were in New York if it were not for her parents. For that, I am so grateful that they tagged along and were there to make it unforgettable. The very next day, on July 27th, I woke up and while I was calm and collected on the outside, I was extremely anxious and nervous on the inside. My heart would race every time an hour on the clock passed by. Eight hours to go… seven… six… I wished time would go faster. It felt like it was the day I had asked her out eight and a half years ago. After a day of sightseeing and being the typical tourist, we got back to the hotel. Just two hours remained. We were back at the hotel. The plan was simple. I told Sharon that we were going to an amazing restaurant (we actually were, but the proposal was first!) and that we had reservations at 8:30. I told her to dress her best. We all got ready and headed down to the lobby. It was so close and all I could do was try and contain my excitement. We took a cab to a building in Midtown. Sharon had no idea what or where the restaurant was. Her mom kept saying it was a surprise since it was her stepdads birthday and wanted no one to know. After a 15-minute cab ride which felt like forever, we were finally dropped off in front of this office building. I saw some doubt in her eyes. She seemed to pick up that something was wrong. This seemed to temporarily deflect her growing feeling that something was amiss. We got on the elevator to the seventh floor. My heart was probably going 140 beats per minute. My hands were starting to shake. I put them in my pockets to hide it. I looked up at the elevators floor indicator. Slowly climbing to seven. We slowly walked out and found ourselves in an office. I quickly looked back at Sharon. There were alarms going off in her head. “I think we have the wrong building. All I see are offices. Are you sure this is the right place?”, she asked. I was starting to freak out. It was getting blatantly obvious something was off for her. We walked over from the elevator to the front desk receptionist and I said we were there for a dinner reservation. The receptionist looked up at me and his eyes lit up. He quickly got up and led us down a hallway. This restored some confidence. We made our way down the hall and to a door on the right with a small window in it. Just outside that door through the window was the next chapter of our lives. The receptionist slowly opened the door. As the door opened, I could see the “Marry Me” sign and all the candles laid about. It was just starting to rain a light drizzle. I could see the lights and buildings past this beautiful arrangement. It was perfect. Just how I had imagined it a million times in my head. I never felt more confident as I walked out ahead of Sharon and onto the rooftop. I looked back and I had done it. The expression on her face was of pure surprise. There was no way she could have known. She was genuinely surprised and speechless. She walked out onto the rooftop taking it all in. The beautiful night sky, the cityscape, the string lights, the rain gently falling all around us. I kneeled down, pulled the ring out, trying to not make it too obvious that my hands were shaking and slowly put the ring on her finger. The stone shimmered and looked stunning. I could tell she loved it at first sight. It was finally official. We were no longer boyfriend and girlfriend. We were engaged! I still can’t wrap my head around it. I finally get to marry my best friend and every day I feel incredibly lucky. I am so glad that I sat in that seat in math class. Like I said before, taking that seat was the greatest decision I ever made in my entire life. I wouldn’t change my decision for the entire world.